While the rest of the Capitol prepared for President Obama’s visit to lobby members of Congress on Syria military strikes, three lawmakers gathered under the hot sun with transit advocates to push for a more bread-and-butter issue: tax benefits for transit riders. 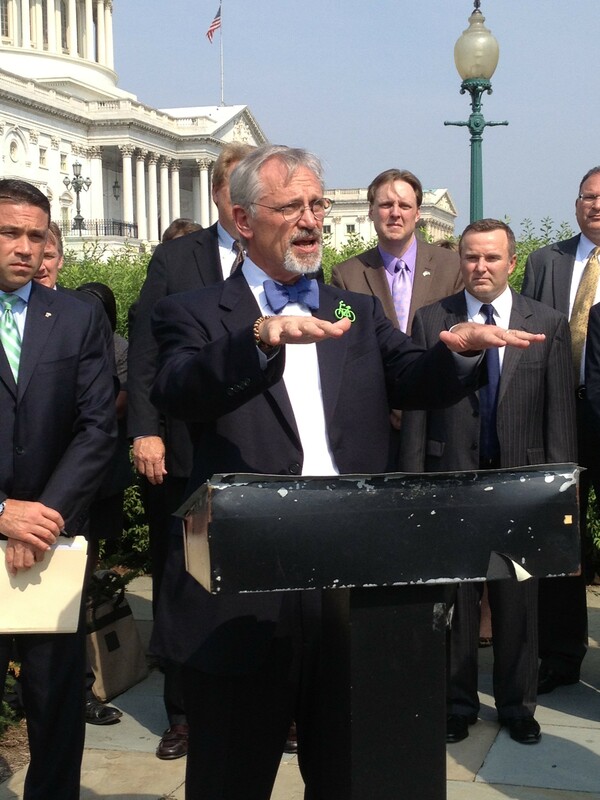 Rep. Earl Blumenauer, sporting his dashing new goatee, illustrates "even-steven." Photo by Tanya Snyder. For years, car commuters could claim up to $240 per month in tax-free driving expenses, while transit riders could claim only up to $125. The 2009 stimulus package brought transit commuter tax benefits up to the same level, but the parity provision kept expiring each year, and lawmakers had to scramble to reinstate it. Transit parity wasn’t reinstated for 2012, reverting the maximum monthly deduction back to $125. A fiscal cliff deal at the beginning of this year not only restored parity for transit riders, it made the change retroactive, setting both transit and parking deductions at a maximum of $245 per month — and creating big headaches for employers. The retroactivity was necessary to restore parity, since otherwise it would have been considered a new change to the tax code. But it was probably more trouble than it was worth, creating a disincentive for employers to offer it. That’s why Reps. Michael Grimm (R-NY), Earl Blumenauer (D-OR), and James McGovern (D-MA) gathered outside the Capitol today to push for their Commuter Parity Act (HR 2288). The bill would make the transit and parking benefits equal on a permanent basis — and would include bike-share as a form of transit. Only two other Republicans have signed on to the bill: Reps. Peter King of Long Island and Robert Wittman of Northern Virginia. But McGovern said he doesn’t know anyone who’s opposed to this bill, on either side of the aisle. It’s good for small businesses, which pay lower payroll taxes when their employees have more tax-free income. And another sweetener is that the measure is revenue-neutral, costing the taxpayer nothing. Many daily transit commuters don’t spend as much as $220 per month, but for commuter rail riders and people with long express bus trips, a higher maximum will make a difference. Other people who stand to benefit are the growing number of Americans incorporating bike-share into their commutes. Blumenauer would like to see commuter benefit parity folded into a grand bargain, which Congress is supposedly going to negotiate soon to bring closure on battles over the budget, the debt ceiling and, potentially, tax reform. But he’s not putting all his eggs in that basket. This is a standalone bill that can pass as such — and with broad bipartisan support. Blumenauer suggested it could even pass on suspension, a quicker way to pass a bill in the House that requires a two-thirds vote in favor. Sen. Chuck Schumer of New York is ready to pick up the mantle in the Senate once the House takes action. Seems to me it would make more sense to drop the transportation fringe benefits altogether (parking, vanpool, transit, and bicycle). The systems really are very complex and expensive to administer. Other people who stand to benefit are the growing number of Americans incorporating bike-share into their commutes. Is a bike share membership a valid usage of the transit dollars? In a perfect world, I’d agree. Drop the benefits, and fold the resulting tax revenue into transit systems so they can reduce fares. But that would never sell. Instead we can effectively fund transit by incentivizing riders via this tax benefit. Oh the wonders of the tax code. The bill would for the first time “include bike-share as a form of transit,” per Tanya. This is of little benefit to urban transit riders, few of whom pay more than $125 per month for their transit rides. It is of great benefit to suburban commuter rail riders, however, most of whom pay well over $125 per month. If the goal is to promote transit-oriented lifestyles, I’m afraid this is a small step in the wrong direction. If the benefit were also valid toward rent or housing payments in cities (perhaps for car-free households only), I’d reverse my objection. In the UK, employers get a massive tax break to provide bicycles to their employees to cycle to work. And zero tax benefit to car drivers. Not very far away, just across the border in Canada, public transit users get a tax credit for transit passes. And zero tax benefit to car drivers. As far as I am aware, the USA is the only country in the world that provides a tax benefit to car drivers. Anyone know of any other examples? Germany has a mode-neutral commuter tax benefit. You can deduct from your taxable income 0.30EUR per kilometer distance between home and work. It used to be the case that only car commuters and transit users got this benefit (and the amount was different between those too), but now it doesn’t matter how you commute. Depends. The Bay Area’s Caltrain system stretches 60 miles. It used to primarily bring commuters from sparser suburbs to SF. Now it brings as many SF residents out to job centers in those sparser suburbs as vice-versa. Those residents for the most part live in areas with a lot of transit and walkable communities. Then you have BART. There may be a big chunk of water between the Embarcadero and West Oakland, but skipping the water you have two dense job/residential areas connected by a train line. If you commute between Oakland and SF or vice versa, you’ll use that benefit. No doubt that I’m oversimplifying somewhat. But even in your Caltrain example, when it’s not bringing suburban residents into the urban core, it’s bringing urban residents into the suburbs – either way, promoting one element or another of suburban development. How about a subsidy for urban residents who work in the city? Perhaps they’ve planned things out so that their commute isn’t very expensive, but in exchange they have higher housing costs. Housing on the Peninsula is on par or more expensive than San Francisco. Noe Valley is expensive, Palo Alto is expensive. East Palo Alto is very inexpensive, Hunters Point is very inexpensive. Belmont might be middle ground, the Outer Sunset is middle ground. But as we researched moving down the Peninsula we found that equivalent housing was equivalent in cost. If you want to say the Peninsula is cheaper, the only argument to use is schools. What’s the point of giving tax benefits to all modes of transit? You’re just giving tax benefits to everyone … except walkers of course, who are creating the most benefit to society yet are not incentivized. Parity is ridiculous. Instead, the government needs to prioritize which modes of transit it wants to prioritize the most and maximize benefits to that mode. Then do the same but at a lesser degree for the next transit priority, etc. I have to say, I agree @Andrew_J_C:disqus. Don’t get me wrong: transit should definitely receive more tax benefits than driving. But it’s weird that the forms of transit that we should be *most* incentivizing — bicycle and walking — get little (bicycling) or no (walking) tax benefits. As you said, our current system rewards people for commuting long distances rather than for living and working in the same city and using their own power to get around. No wonder so few people walk and cycle …. That subsidy is called “not having to own a car” and depending on the jurisdiction it’s a $10-50,000 credit on a home purchase (for not having to buy parking) and $5-8,000 a year thereafter. These tax benefits are nice, but they’re such marginal amounts compared to what people spend on housing and transportation as a whole that I doubt anybody is making major locational choices based on them. Yes, tax benefits should be maintained to encourage transit. More importantly, however, we need to level the playing field between transit and highways, both with respect to funding levels and mechanisms, and project evaluation (both before and after project completion). If projects were really selected and funded based on established priorities and comprehensive analysis of the relative merits and drawbacks associated with various alternatives, then we would likely see a lot more transit investment in urbanized areas where it is desperately needed. People can’t use transit if it is not a viable alternative, and a prospective tax benefit is not an adequate motivation for transit use where the system lacks auto-competitive options, or perhaps even lacks transit alternatives competitive with walking four miles or more. As it stands, there’s and 85/15 funding split, some states (like Illinois) also use an arbitrary geographic split of federal transportation dollars, and transit projects must evaluate outcomes for consistency with anticipated benefits while highway projects lack any form of accountability for delivering claimed benefits. We also need roadway pricing to be implemented with a mandatory transit revenue share component in order to help fund both transit operating and capital expenses; benefits would accrue to both drivers and transit users, discretionary and dependent. If our federal officials really want to support transit and alternative forms of transportation they need to fundamentally overhaul the approach to federal transportation expenditures, not simply examine tax benefits and fight for their retention. There are places that do just that. With a few exceptions (military, regional development, bribing Quebec) the central government in Canada spends zero on supporting highways, but a lot on transit projects. This spending ranges from the general Tax Credit for transit passes to funding specific projects such as the Toronto subway extension currently under construction. But the point is that these subsidies make those cost differentials smaller, so people will end up making the choice even if it isn’t worth as much to them as the true cost of that choice. You’re talking a few hundred dollars per year at most, and to take advantage of that you’d have to be both earning enough to be in a high tax bracket and spending enough on benefit-eligible transportation to make a difference. I have a hard time believing that’s going to be a factor in somebody’s decision to live downtown vs. far enough into the suburbs to access the full benefit. A walk-to-work, car-free person still likely uses transit, and this would just be gravy for an expense they already have. The only choice I could see this affecting would be whether to ride commuter rail or mass transit, if you’re lucky enough to have that choice and were on the edge cost-wise. Don’t oversimplify this now. I live in Berkeley and commute to SF via AC Transit. It costs me $8.40 a day, which equals $164 or so a month. I should be allowed at least equal benefits as a jackass that drives his $20,000 car in SF every day. Why shouldn’t someone who lives in SF and rides Muni (or walks!) to work be entitled to the same benefit? The best way to reduce the subsidy for driving is to reduce the subsidy for driving, not to increase the subsidy for selected forms of not-driving. Stupid fruitcake Blumenauer ruined Pink Martini Thanksgiving concert. He was promoting EB unhealthy ice-cream (sugar water). Thanks from all Oregon moms.